Der Panther mit 8,8 cm L/71 ist ein deutscher premium mittlerer Panzer der Stufe 8. Die Entwicklung einer neuen Ausführung des Panthers wurde im Frühling 1944 begonnen. Die neue Variante sollte den neu entwickelten Schmalturm tragen. 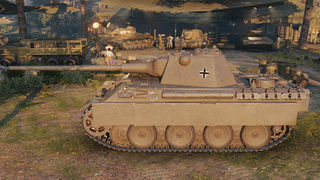 Das neue Fahrzeug wurde auf den Namen Panther Ausf. F. getauft. Am 23. Januar 1945 wurde berichtet, dass das 88-mm-Geschütz des Königstigers in eine verbesserte Version des Turms eingebaut wurde. Große Mengen der neuen Wanne wurden gebaut, der neue Turm aber wurde nie produziert, von ihm gab es nur ein Holzmodell. The Panther mit 8,8 cm L/71 (or Panther 88) is fairly similar to its tech tree counterpart, the Panther II, but has some key differences to differentiate it. For one, it has a noticeably worse hull in terms of armor protection, and it also has a weaker engine, which is partially compensated for with better terrain resistance values but still results in a noticeably slower acceleration and hill climbing ability. To compensate, it has a better rate-of-fire and better gun dispersion parameters with the same gun as the Panther II. The Panther 88 has the same gun as the Panther II in its top configuration, but with improved characteristics to compensate for the platform's weaknesses. It excels at long/medium range combat, where it can use its superior accuracy to pick off targets. It h. In a hull-down position, the Schmalturm turret presents a small and difficult target at long ranges, which can greatly enhance survivability. Due to its similarities to the Panther II, it can use many of the same tactics, although one has to be very mindful of the weaker hull armor and the inferior mobility and play accordingly. The hull of the Panther 88 is exactly the same as that of the Tier VII Panther. 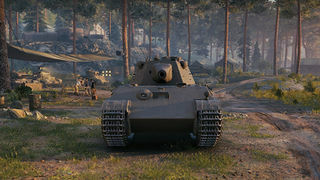 While the armor of the Panther is somewhat acceptable at Tier VII, it is absolutely no match for many of the powerful guns encountered at Tier VIII+. It is also a huge target, and exposing it should be avoided as much as possible. The side armor is also only 50 mm thick. It is a small consolation that this can only be overmatched by the relatively rare 150 mm and larger guns, but it is still very dangerous to expose it in combat, considering that the side of the hull contains ammunition racks and fuel tanks. At short ranges, the Panther 88 suffers, as short range combat favors tanks with heavy armor, high damage guns, or both, neither of which the Panther 88 has. The relatively flat portions of the turret are also much easier to hit at short ranges, a problem it shares with other high tier German tanks. This is not to say that it cannot be effective at close ranges, for it still has a high rate-of-fire and a large HP pool, but using it effectively at close ranges requires a great deal of skill and management of the HP pool, as the armor is effectively irrelevant. It is not recommended that inexperienced players purchase the Panther 88, as it requires a significant amount of knowledge and experience with the game to use effectively. 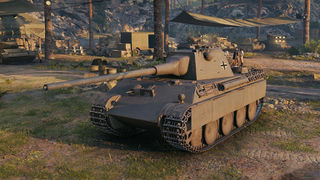 It must be noted that the Panther 88 does not enjoy non-preferential matchmaking and can therefore face Tier X tanks, against which the gun will struggle to do consistent damage from the front. It should also be noted that this tank is the second cheapest Tier VIII premium tank currently available, with only the T26E4 Super Pershing being cheaper. The early impetus for upgrading the Panther came from the concern of Hitler and others that it lacked sufficient armor. Hitler had already insisted on an increase in its armor once, early in its design process in 1942. Discussions involving Hitler in January of 1943 called for further increases in armor, resulting in the tank initially referred to as the Panther 2 (it became the Panther II after April 1943). This upgrade increased the glacis plate to 100 mm (3.9 in), the side armor to 60 mm (2.4 in), and the top armor to 30 mm (1.2 in). The weapon was to remain the KwK 42 L/70. Production of the Panther 2 was slated to begin in September 1943. In a meeting on February 10, 1943, further design changes were proposed, including changes to the steering gears and final drives. Another meeting on February 17, 1943 focused on sharing and standardizing parts between the Tiger II tank and the Panther 2, such as the transmission, all-steel roadwheels, and running gear. No plans were made to include the 8.8 cm L/71 as the turret diameter was too small. In March 1943, MAN indicated that the first prototype would be completed by August 1943. A number of engines were under consideration, among them the new Maybach HL 234 fuel-injected engine (900 hp operated by an 8-speed hydraulic transmission). Thus, plans to replace the original Panther design with the Panther II were already underway before the first Panther had even seen combat. But, from May to June 1943, work on the Panther II ceased, as the focus was shifted to expanding production of the original Panther tank. It is not clear if there was ever an official cancellation; this may have been because the Panther II upgrade path was originally started at Hitler's insistence. The direction that the design was headed would not have been consistent with Germany's need for a mass-produced tank, which was the goal of the Reich Ministry of Armament and War Production. Additionally, many of the problems the Panther II was made to address had been resolved, such as the weak side armor. One Panther II chassis was completed and eventually captured by the U.S. It is now on display at the Patton Museum in Fort Knox. The turret from a Panther (I) Ausf G is mounted on this chassis. Diese Seite wurde zuletzt am 25. Oktober 2016 um 14:11 Uhr geändert.